Heat oven to 350°F. Bake and cool 24 cupcakes as directed on box. In small bowl, tint 1 cup of the vanilla frosting with gel food color to make ivory frosting. 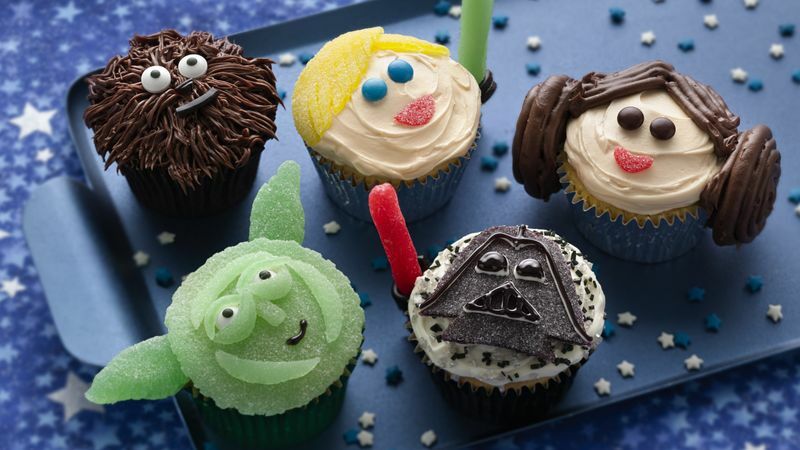 Using photo as a guide, decorate cupcakes to make 5 of Princess Leia, 5 of Luke Skywalker, 5 of Yoda, 5 of Darth Vader and 4 of Chewbacca, or any other combination of characters as desired. To make Princess Leia: Frost cupcake with ivory-tinted frosting. Fill decorating bag (fitted with regular tip) with chocolate frosting; pipe chocolate frosting on top of cupcake to make hair. For mouth, on lightly sugared surface, roll out red gumdrop to 4-inch circle with rolling pin, and cut out mouth; attach to cupcake. For eyes, add brown candy-coated chocolate candies. For hair buns, attach 2 peppermint patties, 1 on each side of cupcake, using small amount of chocolate frosting. Carefully pipe chocolate frosting on top of each patty. Repeat for as many cupcakes as desired. To make Luke Skywalker: Frost cupcake with ivory-tinted frosting. For hair, on lightly sugared surface, roll out yellow gumdrop to 4-inch circle with rolling pin, and cut out for hair; attach to cupcake. For mouth, on lightly sugared surface, roll out red gumdrop to 4-inch circle, and cut out mouth; attach to cupcake. For eyes, add blue candy-coated chocolate candies. To make light saber, wrap top three-fourths of pretzel stick in rolled green or blue gumdrop, and stick in side of cupcake, or attach to side with small amount of frosting. Repeat for as many cupcakes as desired. To make Yoda: Frost cupcake with untinted vanilla frosting. For face, on lightly sugared surface, roll out green gumdrop to 4-inch circle with rolling pin. Completely cover top of frosted cupcake with circle, and trim edges. Attach candy eyeballs with small amount of frosting. For ears, roll out another green gumdrop to approximately 1 1/2-inch circle, and cut in half; pinch ends of each piece to form ears; attach to cupcake, using pretzel stick. Using extra rolled-out gumdrop, cut small crescent-shaped pieces to add around the eyes, and add a small piece for the nose. Add additional strips along edges of face. Pipe on mouth using black gel pen. Repeat for as many cupcakes as desired. To make Darth Vader: Frost cupcake with untinted vanilla or chocolate frosting. For face, on lightly sugared surface, roll out black gumdrop to 2 1/2-inch circle; trim to shape, and attach to top of cupcake. To make face, use black gel pen on top of rolled-out gumdrop. To make mouth, use black gel pen, or cut small section of black licorice; attach to cupcake. To make light saber, wrap top three-fourths of pretzel stick in rolled red gumdrop, and stick in side of cupcake, or attach to side with small amount of frosting. Repeat for as many cupcakes as desired. To make Chewbacca: Switch tip on decorating bag of chocolate frosting to basket-weave tip; pipe sections of chocolate frosting on top of cupcake to look like fur. Continue until covered. Attach candy eyeballs, and use black gel pen for mouth. Repeat for as many cupcakes as desired. To save time, bake cupcakes ahead of time. Assemble all your decorating ingredients, and line countertops with cooking parchment paper to make cleanup easier. To make gumdrops easier to roll out, pop in microwave on Medium (50%) for 10 seconds. Extra sugar also helps prevent sticking during rolling. Star Wars, Princess Leia, Luke Skywalker, Yoda, Darth Vader and Chewbacca are TM & ©2014 Lucasfilm Ltd. All Rights Reserved. Used Under Authorization.